Heads Red BBQ is a BBQ catering company based out of Roselle, Illinois. 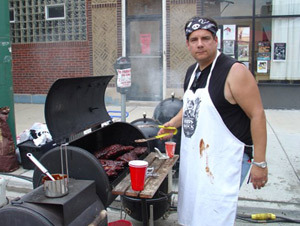 I started out by developing Head’s Red BBQ Sauce when I got involved in BBQ competitions in the Midwest area in 2002. I had always enjoyed cooking authentic slow cooked BBQ at home and decided to try my luck competing with other BBQ cooks from across the country in these competitions. I formed a cooking team with two other BBQ cooks from the area and and we named ourselves the Chi-Town Smokers. In order to set our food apart from the other teams I tried to come up with a sauce that was a bit unique from what other cooks were using. Although the use of commercial BBQ sauces are allowed in competitions I was never completely happy with these sauces mainly because they all tasted pretty much the same and most were overly sweet. That’s when I created Head’s Red BBQ sauce. I took the homemade sauce that I always used for my home BBQ and after some trial and error in the kitchen I came up with what I thought was a good combination of a slightly sweet yet tangy flavor that would complement the meat it was used on instead of overpowering it like most of the commercial stuff does. My sister coined the name for the sauce by combining my childhood nickname along with the deep crimson red color of the sauce. Besides the awards we were winning in the competitions, I still kept getting calls from friends, family and neighbors asking for “more of that Head’s Red” so I figured it was time to take it from the kitchen to the store shelves. I hope you enjoy the sauce as much as others have. I welcome any comments or questions you may have in regards to Head’s Red products or just BBQ in general.